From breeding your mare and raising the foal to managing racing partnerships and insuring your investments, Dutchess Views Farm is a full service Thoroughbred facility. With over 30 years experience in the industry, first class facilities and dedicated staff, we can provide you with the highest level of service in New York. Dutchess Views Farm is owned and managed by Michael Lischin and Anya Sheckley. Growing up near Belmont Racetrack and working on the backstretch there, Michael developed a strong interest and love of horses and horseracing. After finishing NYU Law School and becoming an attorney, Michael began working for the worlds leading horse auction company, Fasig-Tipton, in 1978. He lived in Midway, Kentucky for 15 years and eventually he moved back to New York to fulfill his desire to live and work on his own farm and take advantage of the exceptional NYBred Program. Anya grew up in upstate New York where her love of horses as a teenager had her working at show barns in exchange for riding lessons. Anya went on to develop a career in finance in New York City and enjoyed thoroughbred racing and pedigree research as a hobby. After the tragic events of 9/11/2001, Anya knew she wanted to pursue her love and interest in horses as more than a hobby. Anya joined the farm in 2003, first as Office Manager and later as General Manager. In addition to managing the farm with Michael, Anya has developed Hammertown Insurance Agency which has become one of the most successful equine mortality insurance agencies in the Northeast. 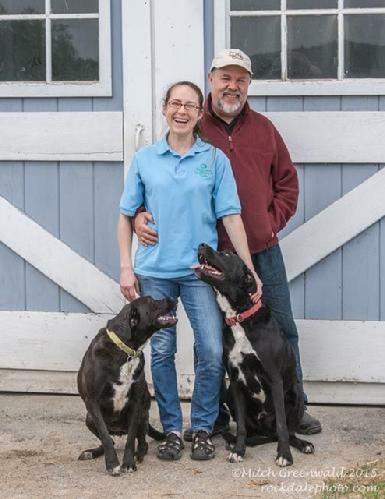 Anya and Michael are husband and wife and live on Dutchess Views Farm with their son. Some of the services Dutchess Views Farm provides are: Boarding, Breeding, Foaling, Sales Prep and Representation, Insurance, Equine Legal Services, Industry Consultation and more. Dutchess Views Farm also puts together partnerships. We specialize in partnerships that include 2-4 owners that enable individual members to be active particpants in the decision making process and the development of the horses.